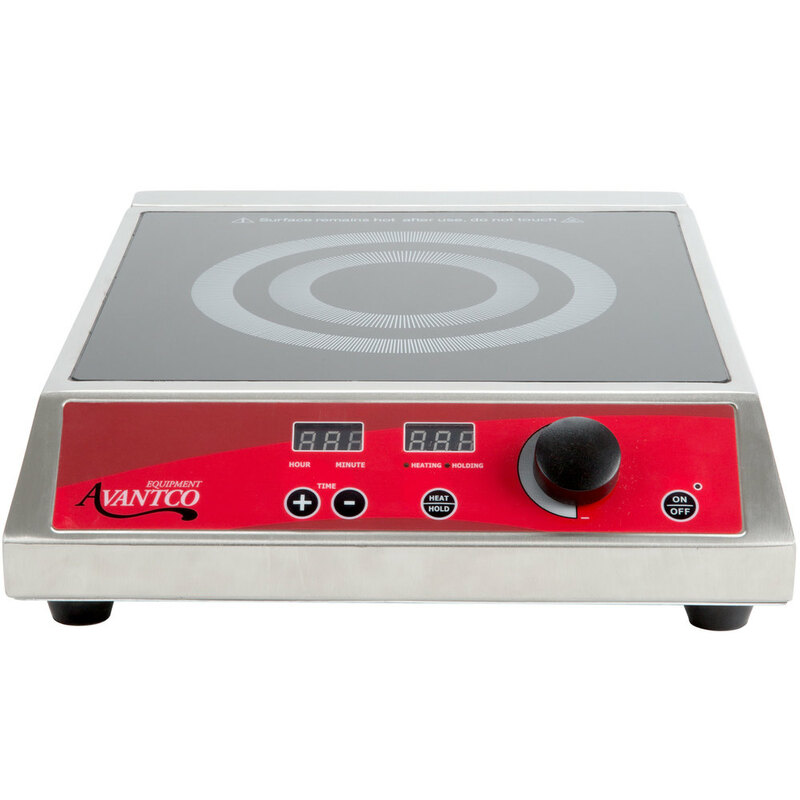 This Avantco IC1800 countertop induction range delivers superior usability and performance for all your cooking needs! 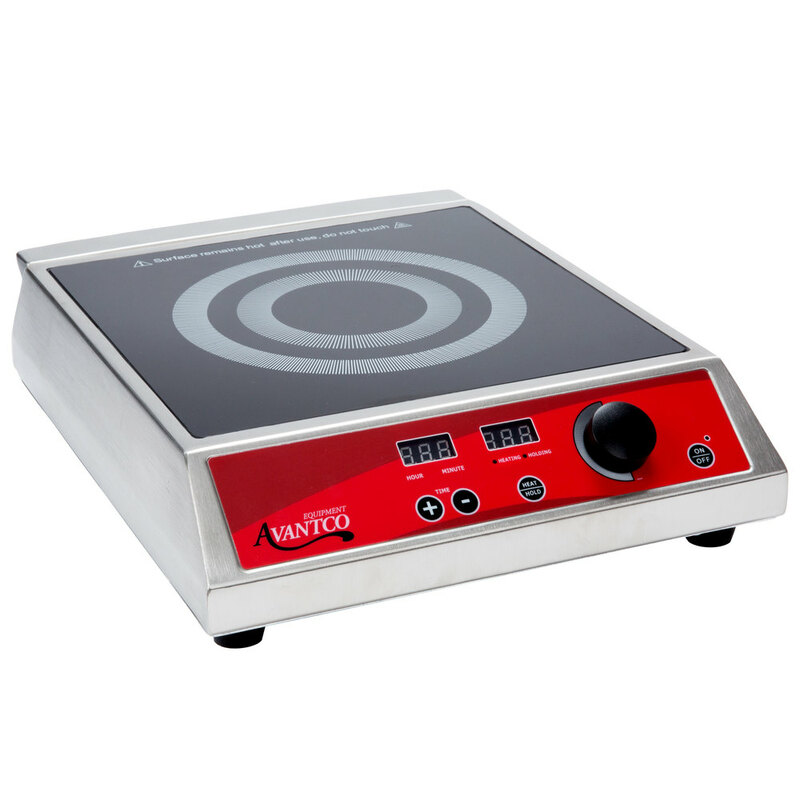 Perfect for use in omelet stations, catering services, display cooking, and other light-duty applications, this induction unit is safer than conventional countertop ranges since there's no open flame or exposed burner. And thanks to its innovative technology, this cooker heats up in as little as one minute. For added convenience, a built-in 175 minute timer allows you to keep track of your culinary creations, and you can cook using a wattage or temperature mode that ranges from 140 - 460 degrees Fahrenheit. And thanks to its multiple heat levels, you can be sure you'll have the ideal temperature for your most popular dishes. - Compatible with pans with a bottom diameter between 4 3/4" and 10 1/4"
Left to Right: 11 3/4"
This range is excellent. 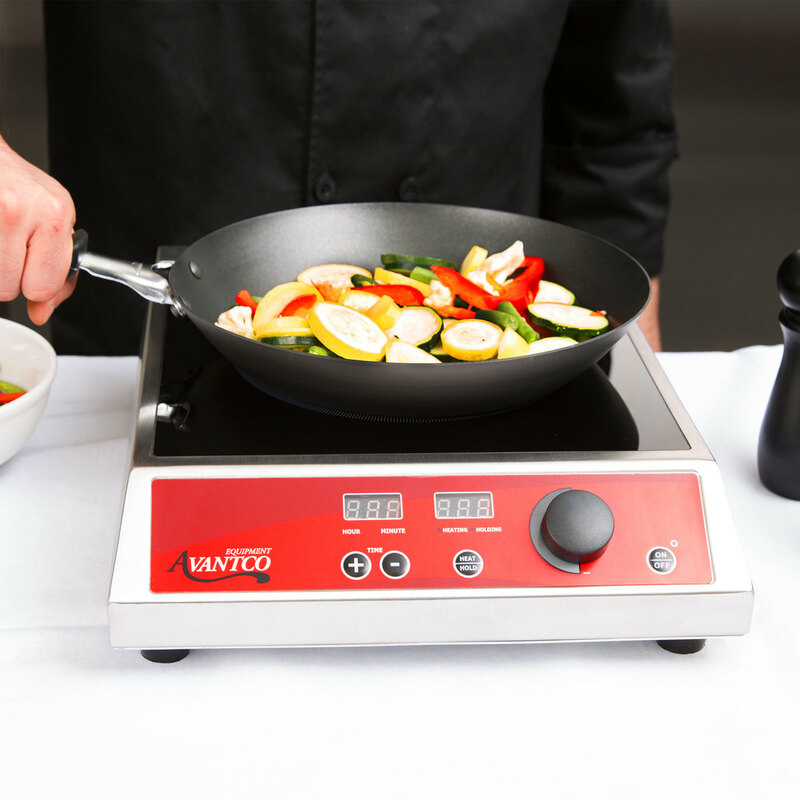 It responds instantly to temperature adjustments and allows for fine control while cooking. Depending on the pan, setting, and how full it is, the cooler can at times let off a high pitched noise. Otherwise, this is a great product. I've purchased 2 of these and so far so good. The high pitched sound is audible if you use the temperature setting. However, if you use the power setting, the high pitch sound is not as audible. It's not as noticeable in a noisy environment and as long as you don't put the setting to high. It works fine for me as I only need it to boil water. We love this induction range. It is a good size for the majority of pots we have, and it has lasted a long time! The cord opened slightly, so we used electrical tape to reseal it and it is as good as new! Love these. Super dependable induction tops. We use them for prep and during service. No complaints whatsoever, and they are really a very good value. This has worked perfect in our coffee shop! It heats up fast and gets plenty hot. It does take a certain kind of pan, we use cast iron. Love this one! Has great power, I can not have an open flame, this eliminates that problem. I would get another if I need one! A workhorse in our kitchen. It is sturdy, large enough to accommodate a 40qt pot, and heats up very quickly. Since we don't have gas in our chocolate shop it's nice to have fast, reliable heat without a traditional stove-top. Love this cook top! Consistent heating and it great for long jobs where you have to stand by and stir for long periods. It doesn't make you hot like standing next to an open flame does. I work at a shared kitchen space, and it's awesome to have a portable cook top because I don't have to fight for time at the shared stove. A+++ so far, so good. We use these ranges (2 side by side) to prepare our sautéed shrimp and to cook onions. The heat is perfect and this is really easy to operate. Performed very well for 4 years of daily use. But we are a salt air environment, which finally took a toll on the circuit board (corrosion). Now needs ridiculously strong pressure on the start button to turn on, and occasionally changes temperature setting at random during use. it was such a good value overall that we have just ordered the exact same thing again as a replacement. Only flaw is that sometimes the temperature dial "skips" a setting (in 10-degree increments) and so you need to look at the display to make sure it is set as intended. Very smart product! I like the safety feature that it turns off the heat when there is no pan/ weight on it. Fast cooking in a tight space. Heats quickly, maintains temperature, this is a really solid option for anyone with a small space. I can hear the high pitch sound that others have mentioned, but I don't use it frequent enough for the sound to drive me crazy. This burner heats up super quick and knows when you place a pan on it...It is cool to touch without the pan. It also is pretty portable and can be stored easily if you don't have a lot of room. Love this product. Heats fast and is super easy to use and lite weight. Only thing keeping it from 5 stars is it doesn’t have requisite certifications so it has been regulated to advanced home use for me. 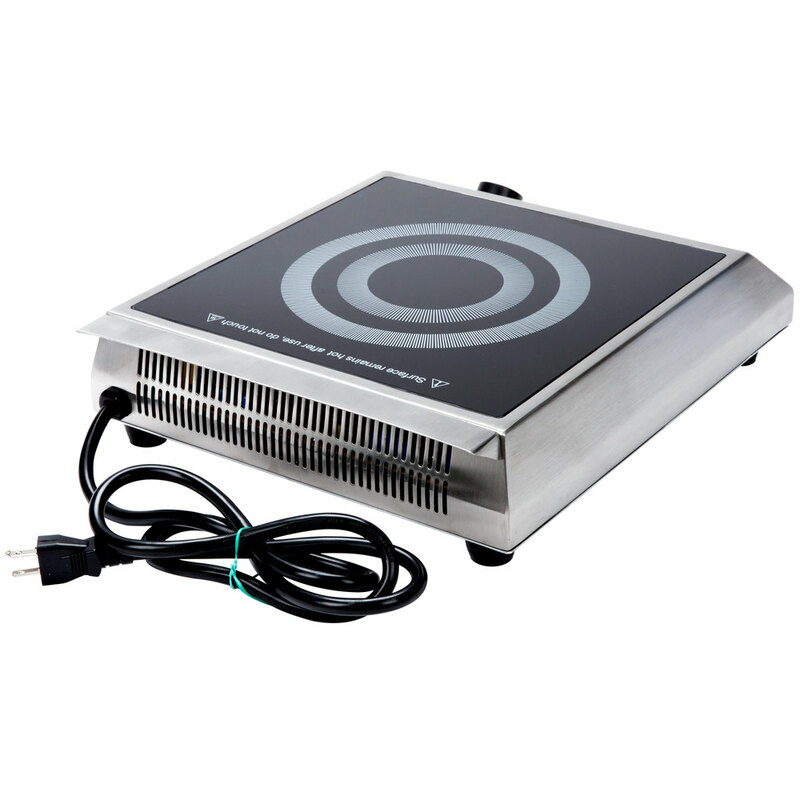 This portable cooktop has some crazy heating power. It gets hot pretty quick. I’ve used Cooktek before which cost 4-5 times more but this does the trick. Save your money and buy this instead of the brand. Great bang for the bucks. I initially felt this purchase was a “wild card” as I’m EXTREMELY sensitive to annoying/repetitive noises, however, I have not had any of those problems!!!! Here are my experiences: 1. Reheating a 4 cup frozen soup container for the days service: I heat it in the microwave for 5 minutes (advantco microwave) and put in my pot on lowest level (1) for 15 minutes and the soup is ready to serve. I switch to a “hold temp” setting of 150 degrees and I’m good to go. 2. Slow Sauté of onions for Philly cheesesteaks takes 4 minutes, top. 3. Mire Poix takes 2 minutes which is 3 minutes quicker than my sauté function on Insatpot. 4. Super easy to clean and I love the beeping function when you remove the pan, a great reminder for my poor short term memory 5. The temperature hold function is my favorite as I can keep my soup at 150 degrees for my customer and know that the health department won’t have any issue. ***Again, I respect those that had trouble with any noise off put but with our 2 fridges, 2 freezers, air con, ice machine, etc, I have yet to notice any disturbances in regards to noise and I’m personally very susceptible to background noise! We bought 2 of these counter top induction ranges and they are great! We highly recommend them for use. We bought them with some stainless steel pans and together it has helped improve efficiency in the store. Exelent product, I have had this induction range for long time, I use it in my restaurant lunch and dinner and works great, also a great value!! The unit is fine, but as other reviewers have stated there is a very noticeable high pitched "whine" that comes from the machine once its past 1400. Not enough to return the unit, but definitely something to think about. We don't often need the use of a burner in our bakery/coffee shop so this induction burner is the perfect solution for the times we do. We are able to store it when not needed and set it up on our work table for quick cooking when we do need it. It boils water quickly, melts butter even faster and is great for jams, jellies, and sauces as well. This cook top is wonderful. I use this to make caramel and other toppings for our baked goods and it works perfectly. It heats up quickly and maintains the temperature very well. The heating control is very responsive too. It was definitely a good buy. This little range/cooker has proven so valuable to our cafe. 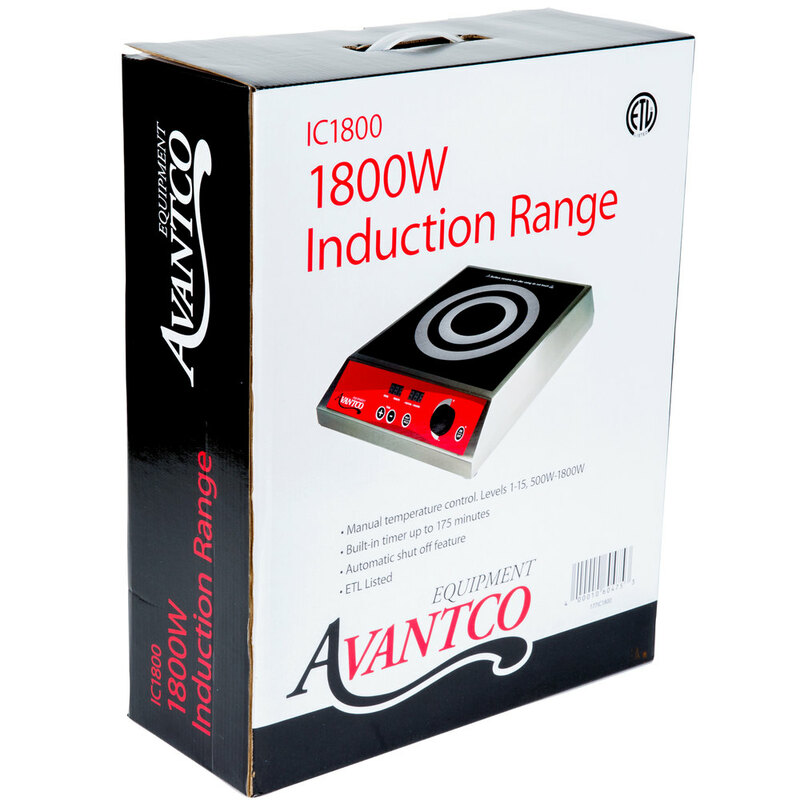 Soups are our most popular item, and without the consistency and durability of the Avantco IC1800 Cooker, we would be far worse off. It heats evenly and quickly. Sturdy unit with amazing temperature control. You can use it as a burner or as a temperature hold unit. Built in digital timer. Easy to clean. It works very well for us. We use it to make sauces, soft boil eggs. 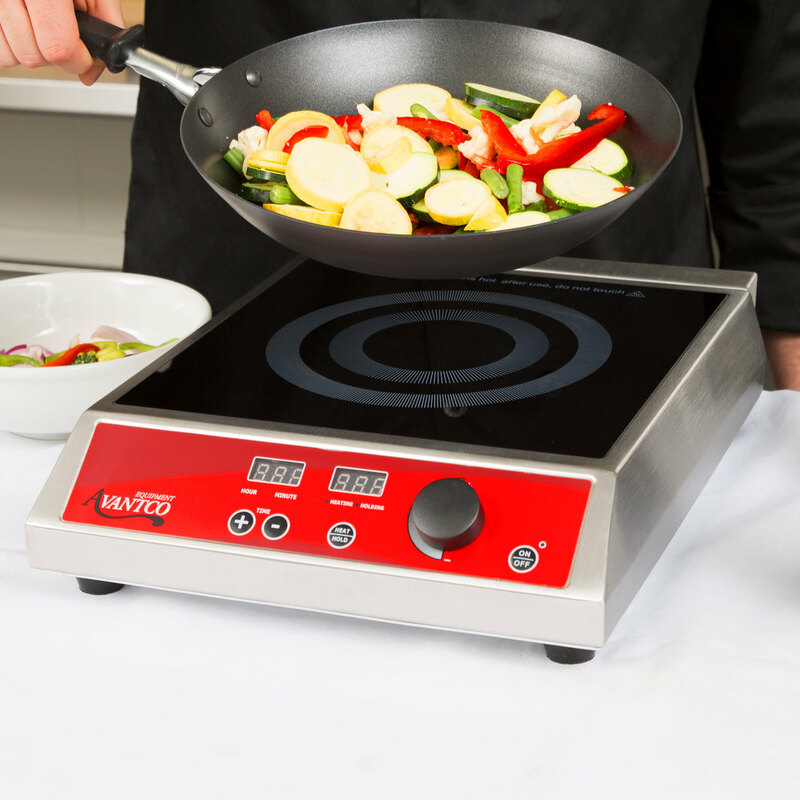 It heats up quickly and is one of the better induction burners we have used. This induction top has been perfect for us to use in our small bar. We use during the day to prep, so we move it around quite a bit. Heats up perfectly and cooks food really well with the proper pots and pans. We do not use it throughout the night, but for light/moderate use, I highly recommend this product! It is a very good product. It is doing its job so far and reaches the temperature very fast. It is easy to clean and to carry everywhere, because it is very light. I don't need to cook a lot in my street food restaurant, so for my usage so far so good! Do you like to cook things well? This guy makes it a lot easier. It has replaced our range top as my go to for almost all endeavors. Heat control is very good. These are a nice addition to a buffet line. The chef can cook omelettes to order and put on a show. Easy to use and the digital display is a nice touch. We have been using induction cooker for almost 2 years. After that, business picked up and we move on to gas stove to make dish in a faster fashion but this cooker is great and long lasting!